Going through an alcohol testing procedure? Want to know how long it takes before alcohol leaves your system? Read more about alcohol detection and share the A4 poster @ basic alcohol detection timeline info. More here. 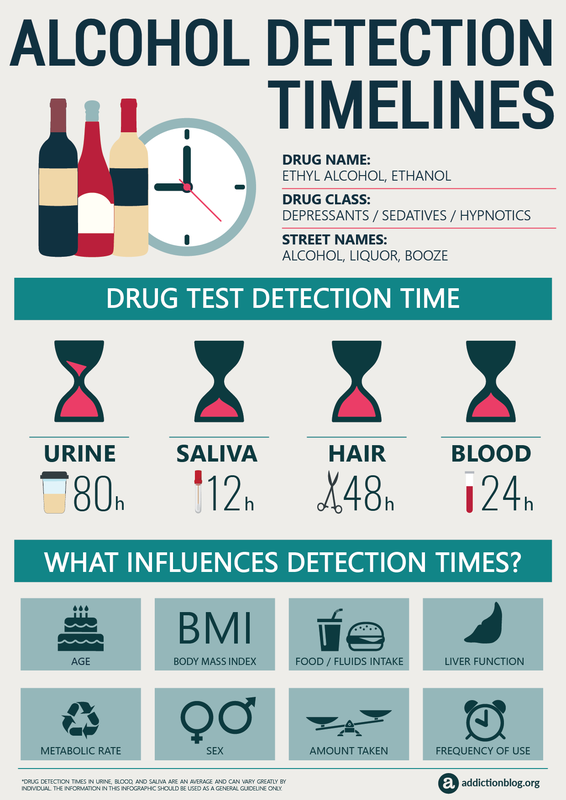 Alcohol testing timelines can help you predict how long alcohol will stay in your system. Alcohol drug tests may include your blood, hair, saliva, and urine. Tests can be used as evidence if there are traces of alcohol in your blood, hair or urine. So, how long does alcohol stay in your blood or urine, exactly? What methods of alcohol detection are used? What factors influence testing timelines? We explore here and invite your questions regarding alcohol detection timelines at the end. In fact, we welcome comments from users! Please leave us a question in the comments section at the end and we’ll try to get back with you personally and promptly. It depends on the type of sample and drug test you give. Urine Alcohol Tests – Generally urinalysis for alcohol can detect the presence of alcohol up to 48 hours after digestion. Alcohol can last from 12 to 36 hours in your urine, depending on a variety of factors… including how long before the test you drank and how much you drank. Hair Alcohol Tests – Using a sample of hair to test for alcohol allows experts to trace alcohol usage for up to 6 months. Saliva Alcohol Tests – Saliva or oral, fluid-based alcohol tests can generally detect alcohol use for up to 12 hours after you stop drinking. Blood Alcohol Tests – It can take up to 2 hours for alcohol to show up in your blood. But once it’s there, a single ounce of pure alcohol is detectable for about 1.5 hours. If you reach a higher blood alcohol concentration (BAC), the alcohol will be detectable for longer, up to roughly 12 hours after you drink. NOTE: Alcohol detection times in urine, blood, and saliva are an average and can vary greatly by individual. The information in this infographic should be used as a general guideline only. If you want to learn more about drug testing, and detection timelines, download our free e-book The Definitive Guide To Drug testing. Still have questions about alcohol detection timelines? We welcome your questions and comments in the section below. Feel free to share a personal story and tell others how it went for you. We try to provide personal and prompt responses to all legitimate inquiries. Hi I’m in a drug program and I’d just like to know how would I know if there using the 80hr tester for the urine test without asking them? They do a lot of tests so to me that would be a lot of wasted money. I’m 23 very skinny I’m 6’2 170 pounds very fast matabolism but don’t drink a lot of water but I do drink a lot of juice if I drink one or 2 beers how long will it b in my system for? Thank you. I don’t have a drinking problem I’m mandated to this program and just like drinking a beer or 2 at night like once or twice a week. Hi Julie. The length of time alcohol stays in your blood is always different and it depends on many factors. We can never be sure until it is tested. How long will 3 regular glasses of wine stay in your system? Hi Amanda. Usually, one serving of alcohol is fully absorbed into the blood stream within 30 minutes to 2 hours after intake. This is because the body can metabolize about 0.25 ounces of alcohol per hour. How long alcohol stay in the body depends from many factors such as age body mass, liver function, metabolic rate etc. Hi Deborah. Alcohol can be detected up to 80 hours in urinalysis, while the detection period for binge or/and chronic users can be longer.